The gallbladder is a pear-shaped sac which is in charge of storing bile produced by the liver. During digestion, the gallbladder contracts and expels the bile through the bile duct into the duodenum. A calculus in the gallbladder or biliary stone (biliary lithiasis) is a concretion that forms in the gallbladder by depositing calcium crystals, excess of cholesterol and bilirubin that were previously dissolved in the bile. 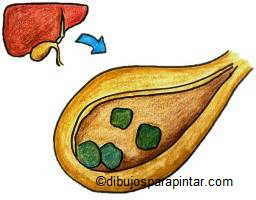 However gallstones may form either in the gallbladder, the bile duct or in any part of the biliary system. Gallstones can be very small or very big. In the first case, they usually appear in groups. Big gallstones use to develop alone. Cholelithiasis refers to the presence of gallstones. Biliary colic is a pain that occurs when a gallstone transiently obstructs the cystic duct and the gallbladder contracts. Cholecystitis is the inflammation of the cystic duct by gallstones. – Cholesterol type: They posses 70 or 80 % of cholesterol content. They are generally green, less frequently yellow or white. A gallstone may have no symptoms or present painful episodes (biliary colic), which usually occurs when the stones are moved from the gallbladder to the bile ducts. In the case of not being able to dissolve, it can affect either the gallbladder, the liver or pancreas. The main symptoms usually are: abdominal pain, pain in the back or or in the shoulder, nausea, dizziness, flatulence, high fever, pain in the sternum, yellowing of the skin, etc. – Excess of cholesterol: Too much food high in cholesterol determines that the body can not use any part of it which is deposited in the gallbladder. – Obesity: Gallstones tend to occur more frequently in obese people. – Inadequate food: An inadequate diet rich in fat and low in fiber favors the formation of gallstones. – Poisons: Similarly, the ingestion of toxic products such as alcohol or tobacco, can facilitate its formation. Although many of the stones dissolve spontaneously without symptoms, others are causing large painful attacks that can endanger the health of the patient. Symptoms of possible biliary colic always require the attention of the doctor to diagnose their existence and the most appropriate treatment to follow. The natural treatment of gallstones involves the use of a series of natural resources that can prevent or dissolve them. A continuous and adequate phytotherapy, together with some correct life and eating habits can help to correct the disease progress.